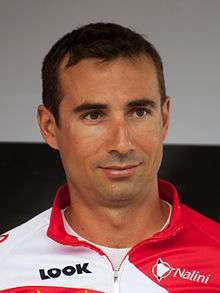 David Moncoutié (born 30 April 1975) is a retired French professional road racing cyclist, who rode with the French team Cofidis, for his entire professional career. 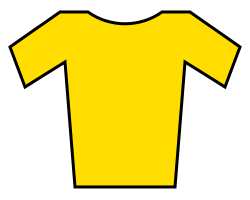 He was a climber, and won his first professional race in a mountain stage of Critérium du Dauphiné Libéré. He won the Mountains Classification in Vuelta a España four times, one short of the record of five held by José Luis Laguía. Moncoutié is the last French cyclist to win a stage of the Tour de France on Bastille Day, the national holiday of France, back in 2005. David Moncoutié had no familial connection to cycling – he was raised in a football (soccer) loving family in which nobody had raced a bike. Moncoutié played football until he was 16 before being introduced to cycling by a friend. He gained his baccalauréat in biology. His father, mother and two sisters worked for the post office and wanted him to work there as well. Friends suggested he join them for a ride. He said: "They all had beautiful racing bikes, I had a sports bike that was nothing to talk about... and I dropped them right from the start. I said to myself,' Tiens, you're not going to be too bad!' and I joined the Entente Vélocipédique Bretenous-Bars, my village in the Lot. I won from my second race." Since the start, for me cycling was all about pleasure. When I started I didn't think, for example, that one day I would ride the Tour de France. In a way, I am like a weekend cyclist who gets on his bike on a Saturday or a Sunday simply for the pleasure. OK, I suppose with age you start to assume a bit more responsibility and see it more like a job. But for me, the most important thing is that I enjoy it. The magazine Vélo said he had a "calm and a lucidity, a way of talking openly, something too of a rage hidden behind a smile, for him, a little painful." He is known as a clean cyclist who relies on homeopathy. François Migraine of Cofidis said: "Everyone is more or less unanimous that David Moncoutié doesn't dabble [in drugs]. I would have 10 of him in the team if I could. He wins three races a year and he still manages to finish in the UCI's top 50. It goes to show that you don't have to dabble in drugs to have a career in cycling." When Cofidis was at the centre of a doping scandal in 2004, one of those at the centre of events, Philippe Gaumont, wrote that Moncoutie did not follow most riders in taking drugs. David is a loner. He's happy in a group but he doesn't need it to live. When I came to the team, I said to myself, as other people must have, that I was going to try to change him, to chivvy him up so that he got more involved, that he raised his ambitions. Today, I realise that even if I find one or two keys to open the door, I won't get very far. It doesn't interest him. He just wants to be left in peace. It was the day before the national éspoirs championship in 1996. I was an amateur with the VC Blagnac and doing my national service with the Joinville Battalion, but I'd never made much of an impact and I hadn't won the least international race. On the other hand, I had a small reputation as a climber. I'd spoken to Guimard a couple of times on the phone and he came to see me, a contract in his hand." That season, I won a stage of the Tour du Pays Basque, I came 13th in the Tour of Catalonia and sixth in the Dauphiné Libéré, so I said to myself 'Why not?' I was hoping to end up reasonably high in the general classification. But in the Tour, that's madness. From the Vosges, I realised that the best I could hope for was a stage. I've often heard it said that I could finish in the first five of the Tour de France. It's a dream! Me, I've never believed that. I've always fixed myself realisable objectives that matched my way of riding and my convictions. Moncoutié said: "A single stage, that could seem a bit thin but for me, that's enough. The emotion that I felt was enormous. In one day, I had saved my Tour." 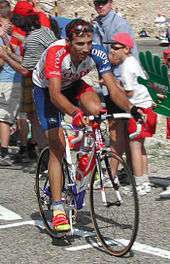 He won a stage in the Critérium du Dauphiné Libéré in 1999, the Tour de l'Avenir in 2000, the Tour of Limousin (2001), the Critérium International (2002) and the Tour of the Mediterranean (2003). He won the 2010 Vuelta a España stage 8 in a mountaintop finishing in Xorret de Cati that included five mountain passes. He crossed the finish line solo and celebrated a prestigious victory. ↑ An army unit to which talented athletes were sent. ↑ "Vuelta 8: David Moncoutie triumphs in mountains". Cycling New. Future Publishing Limited. 11 May 2012. Retrieved 11 May 2012. Wikimedia Commons has media related to David Moncoutié.